White Widow Autoflowering seeds are an Autoflowering version of the world-famous White Widow Cannabis strain. 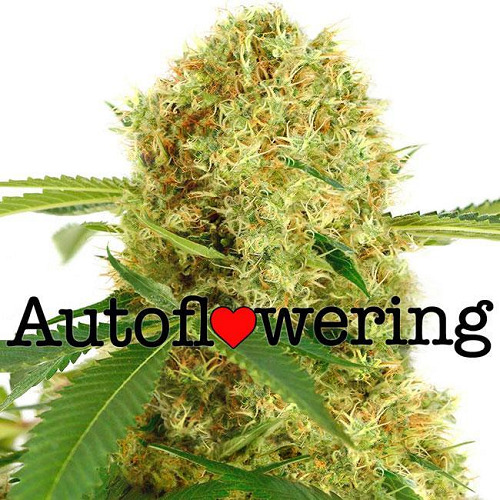 Compact and easy to grow, these Autoflowering seeds are the perfect choice for beginners and more experienced growers alike. An excellent Cannabis strain for both indoor and outdoor growing, remaining short and squat with a large central cola. White Widow Autoflowering seeds grow to between 50 cm – 60 cm tall, mainly producing one large central cola, making them discreet outdoors and perfect for Sea-Of-Green growing indoors, producing approximately 120 grams of Cannabis buds per square meter. White Widow is a very potent and powerful Marijuana variety, available on the top of all Dutch Coffee-Shop menu’s. The buzz is powerful and energetic with a social high. Very strong, you will not be disappointed with White Widow Cannabis. White Widow Autoflowering seeds are perfect for beginners, being one of the easiest strains to grow. 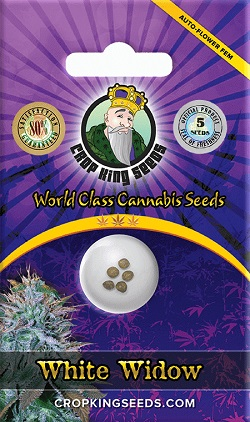 Very forgiving, producing strong, sturdy plants that grow well indoors and outside with good yields from every plant..
All these White Widow autoflowering seeds are feminized, producing only female plants, and are included in the suppliers germination guarantee..
Buy the very best quality White Widow Autoflower seeds, with free, guaranteed delivery to the Canada, USA and Europe. Buy White Widow Autoflowering Seeds today and receive fast discreet shipping to Canada and all US states.